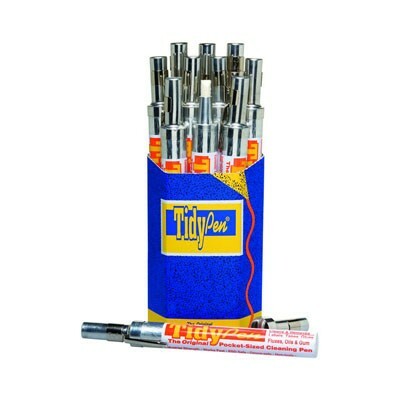 TidyPens lift tape residues and adhesives that nothing else will touch. TidyPens saves time and hassles by dispensing a precise amount of a powerful, natural cleaner that penetrates quickly, dissolving and removing adhesives and glues all kinds. This means TidyPens zip away glues, bar code labels and price tags; they even remove chewing gum from the floor and tar from the side of your car. TidyPens will not stain or leave residues and can easily be carried in a shirt pocket. The cleaner is natural, biodegradable, and safe for the ozone layer. They're great in tool kits, but other uses include quality inspectors, foremen, nurses, auto dealers and office workers. The pens are built from aluminum, so they are unbreakable, spill-proof and easily recycled.